and returns the grub4dos variable dow which is a number from 0-6 (0-Sunday, 1-Monday, etc.). This means you can call it to test what day of the week it is. # don't allow at weekends, just shutdown! As well as recognising $HOME$ in .txt and .mnu files, E2B now will replace $NAME$ with the filename of the .txt or .mnu file. This means that a .mnu file can contain $NAME$ and all you have to do is make sure the .mnu file has exactly the same filename as the ISO that it uses. e.g. before we had this type of .mnu which we had to edit, in order to use a different ISO file. As long as the filename of the .mnu is identical to the filename of the .ISO file, you do not have to edit the contents of the .mnu file to use it on different ISOs - just copy it and change it's filename. Basically same as v.1.65 with + a few Spanish/German tweaks and the E2B_Editor.exe added. More changes - I can't stop tinkering! Checkout the accent over the Ú in MENÚ PRINCIPAL. Note that the grub4dos password will never be ticked after loading a .cfg file (even if it has a password set or reset in it). Before saving the .cfg file you must tick the 'No grub4dos password' checkbox each time if you want that option. Also note that the AUTONUM=0 will be ticked if your .cfg file contains any type of AUTONUM setting (it assumes you have set AUTONUM=0 even if it was set to something else!). I think it is pretty much finished now. Latest beta version now does not need the OCX file. Can load any .cfg file or .bmp file. Keep checking for the latest version! If you are feeling adventurous, try the new E2B Menu editor (written in VB6). A Beta version can be found in the E2B Alternate Download pages. Note: the first version required COMDLG32.OCX control - there is a separate ZIP file to install and register this. Subsequent versions don't require the OCX. 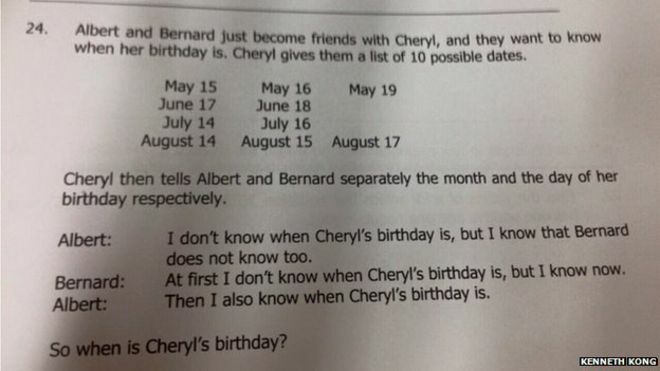 The 'Cheryl's Birthday' maths test for the top 15/16 year olds in Singapore - can you solve it? Here is a link to the problem that's taken the world by storm and a video on how to solve it. For the 'What colour hat am I wearing' puzzle - click here. Two students arrange to meet - both thought they had arrived at the correct time, but one was 29 minutes late - how come? Click here. Want some more? Click here. set CENTREHD=1 will now auto-centre menu headings. Current language displayed in footer HELPTEXT (can be changed in MyE2B.cfg). grub4dos letters, e.g. p for password entry and c and e now only work if SHIFT is pressed at same time. Small speed improvement in counting Windows ISOs. New version of hotkey utility (thanks chenall!). New version of grub4dos 0.4.6a. See previous blog posts for details. The new MPI Tool Kit now centres the heading and payload description in the CSM menu and the \menu.lst is re-organised to help you make modifications more easily. It also now has hotkeys for F7/F9/F10 and first-letter menu hotkeys too. New grub4dos 0.4.6a is used too. If you want your own background and menu for the CSM menu, just use the CUSTOM folder in the download to add any new or replacement files. I had an email from a very cross guy called Khan today, asking me to provide instructions on how to make an Easy2Boot USB drive that are written in Klingon, as his Earth-English is not very good. So Khan, please click HERE. Chenall has fixed a few bugs in new grub4dos and the new hotkey utility. The Menu hotkeys have changed (they all use Ctrl key now). The Windows Install Menu is now Ctrl+I not W plus some others have changed! Grub4dos password entry now needs SHIFT key before pressing p. Same for c, b and e.
Changed the way I detect Admin rights in Make_E2B_USB_Drive.cmd and QEMU_MENU_TEST.cmd. Grub4dos 0.4.5c/0.4.6a menu and USB driver menu moved from Main menu to Utilities menu. As soon as chenall fixes and releases new grub4dos 0.4.6a I will release this new version. Spot the changed hotkey assignments and new wallpaper! Which is the best Portable app. Launcher for your USB drive? It is often useful to have portable apps on your USB drive, so that you do not have to install any applications or drivers on the system that you are trying to use or fix. Portable apps launchers are great, but most often you will need to run a launcher from a WinPE environment rather than a full Windows OS with .Net and WoW64 (the Windows-on-Windows 'thunking' which allows Windows to run a 32-bit application in a 64-bit OS). Many of the portable apps themselves are 32-bit only apps (and thus require a full 64-bit OS or WoW add-ins), but what about the Launcher apps? If these require a full blown OS to run in with .Net, etc. then we cannot even run the Launcher app to choose a portable app! Note: Check out PEStartup for a 32-bit and 64-bit alternative for WinPE OS's here. pendriveapps.com - A 'library' of all free portable apps with links. Useful for finding and adding portable apps to your launcher! After making the YouTube video about configuring the menu and centering menu headings, I thought that maybe I should support automatically centered menu headings. This would save having to manually modify all the STRINGS.txt files just to have centred menu headings. to the \_ISO\MyE2B.cfg configuration file. If the value is 1, then E2B will use the menuw (menu width) setting to calculate where the centre point of the menu is. This would be the normal use for it. So if menuw is 65 then E2B will use 65 as the menu width for centering the headings. However, you can specify your own value for CENTREHD. For instance if your menu width is 65 characters, but you want your menus to appear a little bit to the left of centre, use a CENTREHD value of say, 60 instead of 1. The Beta is available in the Alternate Download areas. Let me know if you find a problem! Tidbit: Freda, a female acquaintance of mine, named her red setter puppy Heathcliff because she is a big fan of Emily Bronte. However, it turned out not to be such a good idea, She takes it for walks on the Chiltern hills, and if it gets lost, she goes wandering all over the hills shouting 'Heathcliff, Heathcliff'! The other dog walkers look at her like she has just escaped from the local asylum! I have had a few requests by people to make a MyE2B.cfg for them and also a request on more info on how to change and/or center headings. So here is a new (quite long!) video. Hope you don't fall asleep watching it!